Pine Island Glacier in Antarctica, seen from NASA's Terra satellite. NASA/GSFC/METI/ERSDAC/JAROS; U.S./Japan ASTER Science Team. Antarctica is so vast that the pictures give you no sense of scale. 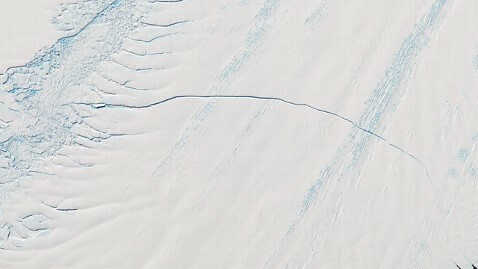 The pencil-thin line across the satellite image of Pine Island Glacier (above) is actually a crack more than 18 miles long, 800 feet across in places, and 180 feet deep. And it's growing. In the next few months, scientists expect the glacier to create an iceberg about 350 square miles in area. It will probably float northward, melting as it goes. "Pine Island Glacier is losing ice very quickly, about six meters per year," said Michael Studinger of NASA's Goddard Space Flight Center in Maryland, which sent an expedition called Operation IceBridge to Antarctica in October in an old DC-8 jetliner, modified for scientific operations. It spotted the break in the ice. Earth-observing satellites have been watching it since. "These things happen on a semi-regular basis in both the Arctic and Antarctic, but it's still a fairly large event," said John Sonntag, Instrument Team Lead for Operation IceBridge, in video recorded on the plane. "So we wanted to make sure we captured as much of that process as we could. "A lot of times when you're in science, you don't get to capture the big stories as they happen, because you're not there at the right place at the right time," he said, "but this time we were." To scientists, this is more than a vast spectacle. Both polar caps are losing ice, and researchers studying the world's climate say they want to understand the process.